As President Trump's chief of staff, Reince Priebus attends an Air Traffic Control Reform Initiative event at the White House on June 5. President Trump talks with retired Marine Gen. John Kelly during a meeting at the White House in January. 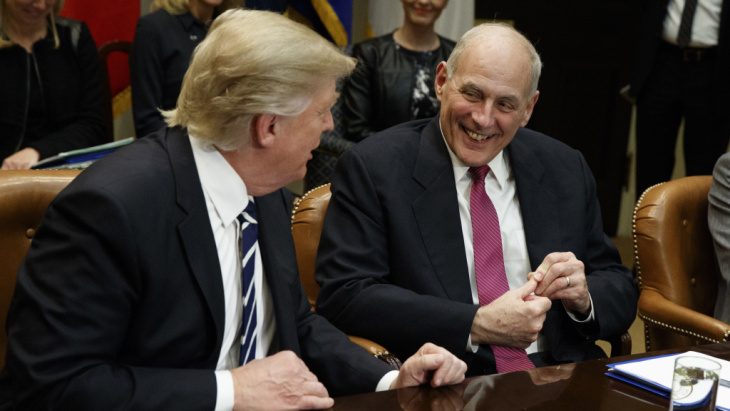 Trump announced Friday evening that he was naming Kelly to be his new chief of staff. President Trump announced on Twitter on Friday that Homeland Security Secretary John Kelly has been named as Priebus' replacement. As chairman of the Republican National Committee during the 2016 presidential campaign, Priebus' team supplanted a thin Trump campaign with money and staff to help Trump win the presidency. That brought Trump and Priebus close, but it was never a natural fit — the mild-mannered, careful former Wisconsin Republican Party leader with the Midwestern accent, once critically described as the "nebbish's nebbish," and the flashy, cavalier New York billionaire. Priebus' exit indicates the full decline in the White House of the RNC-led Washington contingent. Priebus was the last of the high-profile RNC staffers to exit the West Wing. Months ago, Priebus' deputy, Katie Walsh — a former RNC chief of staff, who was accused of being a leaker by rivals inside the White House — left to work on a PAC supporting Trump. Then it was Sean Spicer, the beleaguered press secretary doubling as communications director, who left the day Trump brought on board New York financier Anthony Scaramucci as the new communications director. Priebus' tenure lasted just seven months, an unusually short stint for a president's first chief of staff. 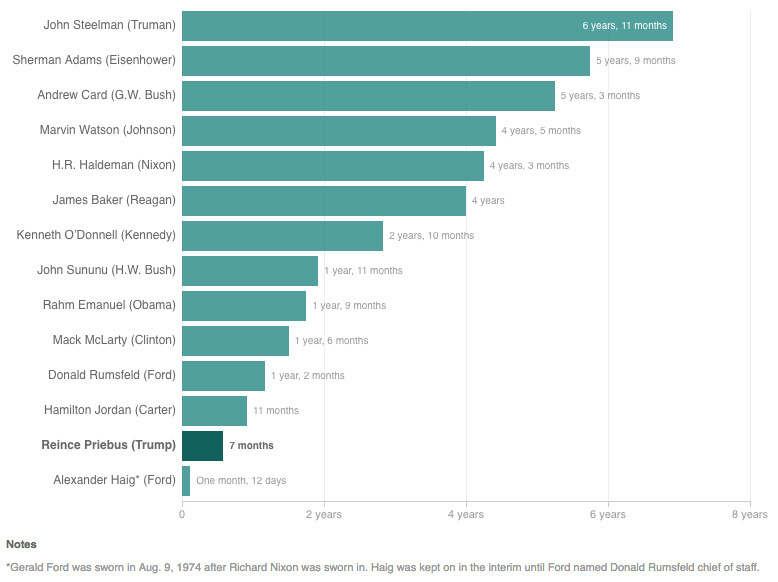 Reince Priebus served less time as a president’s first chief of staff than anyone since World War II. Despite lauding Priebus in his first appearance in the White House briefing room, Scaramucci days later revealed simmering tensions with the then-chief of staff. Those tensions burst wide open into public view Thursday when it was revealed that Scaramucci, who refers to himself as "The Mooch," called a reporter and unloaded on Priebus. "Reince is ... a paranoiac," Scaramucci told The New Yorker's Ryan Lizza. Scaramucci was annoyed, thinking his financial disclosure was leaked to the media. It turns out that a Politico reporter obtained it through a public-information request. Fearful of an unscheduled meeting or phone call or even a rogue tweet at the thumbs of the president, Priebus made a point of keeping close to Trump's side. But there were signs that Priebus was, at times, out of the loop, like when Trump decided to hire Scaramucci. Both Priebus and senior adviser Steve Bannon reportedly objected strenuously to the move. The fact that Priebus is the one who is out certainly lends credence to the idea that the New York contingent, which believes in letting Trump be Trump, is ascendant in the White House. As chairman of the RNC, Priebus had the unenviable role of trying to keep the roof on the Republican Party house with Trump, an outsider tornado, spiraling toward it. Priebus tried to contain the tornado, getting Trump to agree to a pledge not to run as third party candidate if he lost the Republican nomination. But the tornado of Trump only got stronger, and no amount of plywood and nails would keep the house in order. Instead, Priebus opened the doors and arguably did more than anyone else in the party to embrace the coming force. That didn't mean he wasn't critical. "No woman should ever be described in these terms or talked about in this manner. Ever," Priebus said in October when an Access Hollywood video was revealed. On it, Trump was caught on tape bragging about grabbing women "by the p****," because "when you're a star, they let you do anything." But Priebus had to temper his criticisms throughout the campaign so he didn't suffer Trump's wrath — and the party didn't implode. During the general election campaign, Priebus' RNC wound up supplementing Trump's skeleton campaign with millions of dollars in resources and hundreds of field workers in key states. Priebus eventually won over Trump. Perhaps it was a calculated decision to get support from someone with ties to a crucial state. Trump needed Priebus, a member of the so-called "Cheesehead Mafia." Priebus is close with House Speaker Paul Ryan, a fellow Wisconsinite. (Ryan is actually Priebus' congressman.) On Thursday, Ryan had praised Priebus for doing "a fantastic job" as White House chief of staff. "I believe he has the president's confidence," Ryan told reporters. Ryan released a statement following Trump's announcement. "Reince Priebus has left it all out on the field, for our party and our country," Ryan said. "He has achieved so much, and he has done it all with class." Ryan added that he was looking forward to working with Kelly as well. Why make an enemy of Priebus, when he could be a critical ally as Trump tried to get his agenda passed? But the wheels have been anything but greased. Priebus' exit comes a day after Republicans' health care efforts were sunk in Congress, at least for now. 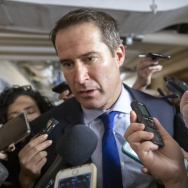 A tax overhaul hasn't materialized, despite pledges of addressing it by the summer. And a conversation on infrastructure is only talk of the future. 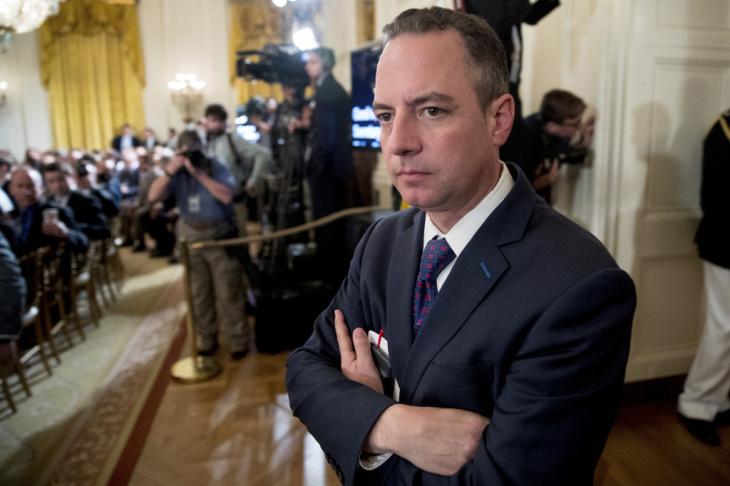 A chief of staff traditionally is the gatekeeper for the president, but despite his best efforts, Priebus struggled to be that. Trump has ruffled feathers with off-message tweets, his handling of the Russia investigation, the firing James Comey as FBI director (arguably his most high-profile political miscue) and his public shaming of Attorney General Jeff Sessions, which has turned many congressional Republicans on the president. Trump's new White House chief of staff is retired Marine Gen. John Kelly. Before taking over as secretary of homeland security, Kelly served in the top slot of the U.S. Southern Command, the Pentagon's area of responsibility focused on the Caribbean and South America. Trump has shown an affinity for generals in his administration. Retired Gen. James Mattis is Trump's defense secretary, and Trump's first choice for national security adviser was retired Army Lt. Gen. Mike Flynn. Kelly was confirmed with bipartisan support by the Senate, 88-11, on Inauguration Day. He had been leading DHS' recent surge in efforts to crackdown on illegal immigration — a core campaign promise by Trump. On Friday afternoon, during a speech in Long Island, N.Y., Trump gave what now seem like foreshadowing remarks. "I want to congratulate John Kelly, who has done an incredible job of secretary of homeland security," Trump said. "Incredible." Kelly has, however, clashed with congressional Democrats in recent months because he has indicated the Trump administration was unlikely to continue the Obama-era deferred action for childhood arrivals program that protects certain eligible youth from deportation if they were brought to the U.S. illegally by their parents. The retired general has told Democrats that it is Congress' responsibility to change immigration laws if they want to codify DACA. Trump has yet to say who he plans to nominate to take Kelly's place atop the Department of Homeland Security. The Senate will have to vote to confirm whomever he chooses.